Connie L. Martin, 77, of Sterling, died Friday, May 26, 2017, at Sterling Presbyterian Manor, Sterling. Connie was born August 1, 1939, in Lyons, Kansas the daughter of Merle R. and Mary M. Kern Smith. 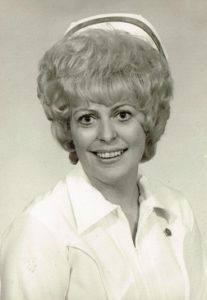 Connie graduated from Lyons High School, with the class of 1957. She was a lifelong Rice and Reno county resident. She worked as a LPN in Rice and Reno counties. Connie was a member of Christian Church, Lyons and Beta Sigma Phi, Lyons. In December of 1959 Connie was united in marriage with Louis Martin. They later divorced. She is survived by her mother, Mary Smith, Sterling, KS. ; sons, Tracy and Donna Martin, Altus, OK., Terry and Tammy Martin, Woodland Park, CO., Tim and Marie Martin, Alden, KS., Tom Martin, Wichita, KS. ; sister, Darlene Gurney, Hutchinson, KS. ; 9 grandchildren and 8 great grandchildren. She was preceded in death by her father. Funeral services will be 10:00 A.M., Thursday, June 1, 2017 at Birzer Funeral Home, Lyons with the Rev. Ron DeVore officiating. Visitation will be from 6:00 to 8:00 P.M., Wednesday, May 31, 2017 at Birzer Funeral Home, Lyons. Burial will be at Lyons Municipal Cemetery. Memorials may be made to Sterling Presbyterian Manor or Hutchinson Animal Shelter in care of Birzer Funeral Home, Lyons.